Hydrangeas are my all time favorite flower. 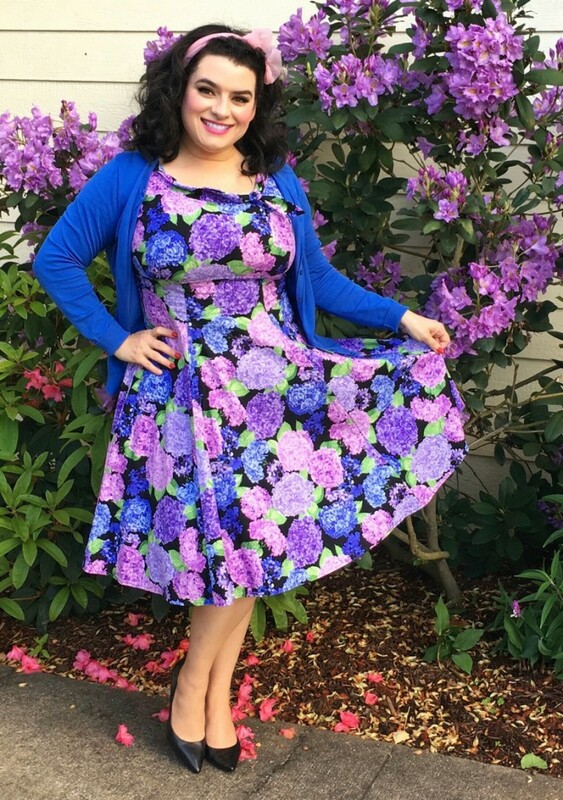 When I first saw this Heart of Haute Hydrangea print dress in the Beverly pattern, I ordered it as quickly as I could because I knew it would fit my curves exquisitely and the quality would be outstanding. I was not disappointed!! For these pics I posed next our blooming Rhododendrons because our Hydrangeas haven’t bloomed yet. The colors on this Hydrangea print are so vivid and bright; they really pop!! The Hydrangea heads are like magnificent floral globes. The Beverly dress features an empire waist with fitted seams, a full swing skirt, round collar with adorable bow tie. This dress is not only work appropriate but is so feminine and flirty that it can also be worn shopping and going out to dinner. In these pics of me, I wore it out to dinner that evening with my hubby and had so many people admiring me and complimenting me on how pretty I looked!! 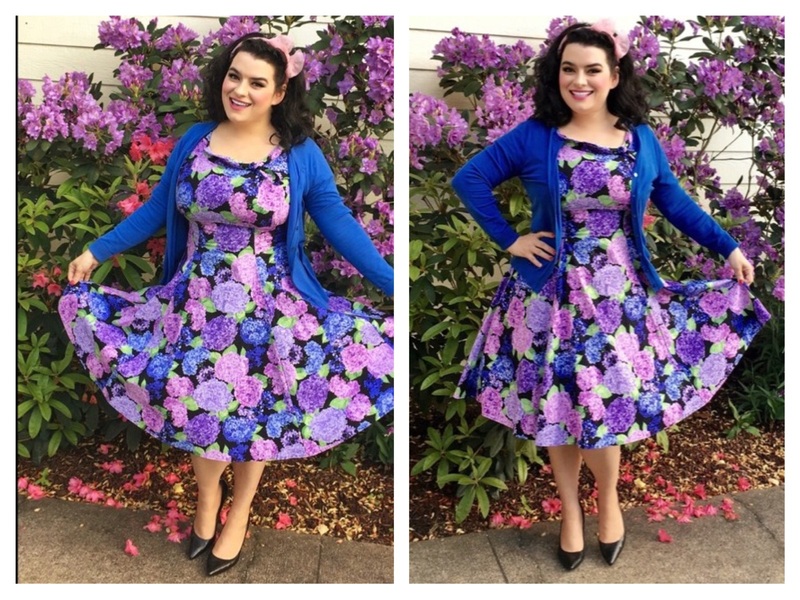 I added a cardigan and the dress has so many great colors that matching it with a cardigan and petticoat will not be a problem for you. In these pics I am not wearing a petticoat and the swing skirt is still very full. For reference, I am wearing the dress in size 1X to fit my breasts and have lots of room in the waist but, the the dress ties in back so it takes up the extra room in the waist. Heart of Haute is a quality brand owned and operated by mother-daughter team of Teresa and Mandie Becker in California. All clothing is made in the USA and is vintage inspired. You can find dresses, skirts, tops, sweaters and accessories at this fabulous shop. Customer service is dynamite and your orders are shipped quickly and packaged with great care. Heart of Haute regularly has new items that will surely have you lusting for their latest designs and you can be confident knowing you’ll look like a gorgeous bombshell every time! !